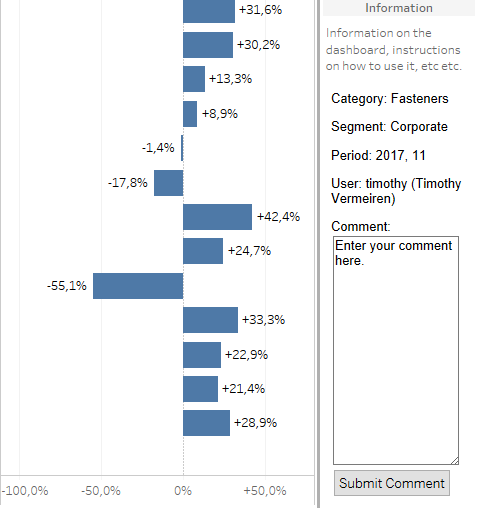 Something I often hear after finishing a dashboard, as a Tableau Consultant, is the following: “Now can we add comments to this chart/dashboard/report?” Comments help create a context for users who require it, and thereby helps people understand the data they are looking at. For example, a plant manager can indicate a declining production in a certain month was due to maintenance taking place in a certain machine. While the answer to the aforementioned question is usually yes, there are different ways to implement this, some easier and some more complex. An alternative is to make use of a combination of Google Forms and Google Sheets. The form being filled out feeds the Google Sheet, which is then connected to the dashboard as a data source. The way that the form is integrated and filled out, can vary, but the form retains the look and feel defined by Google. Hence, this method requires slightly more preparation, but is somewhat more flexible. A third possibility, which will be explained in this post, is more complex in setup, but offers the highest level of flexibility. It consists of a custom web page, integrated into the dashboard, which feeds a database that will contain the comments (and feed these back). Let’s go with the following scenario to illustrate the concepts around this third possibility: we have a dashboard with just one sheet, which we want to comment on. 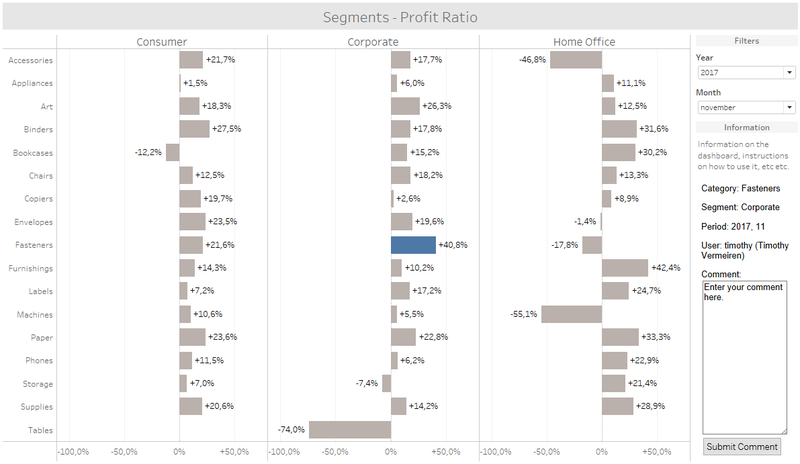 The dashboard represents our profit ratio, for each Category of products we have, per Segment. The dashboard is usually released monthly, release/version which can be selected using the filters on the right. You may recognize a hint of Superstore here (where Sub-Category has taken the place and name of Category). Also added to the sheet are two fields containing ATTR(USERNAME()) and ATTR(FULLNAME()), as to be able to identify the user who posted the comment later on. The Tableau username of the person who has posted the comment. The timestamp of when the comment has been posted. The timestamp can be automatically filled in by how it is defined, although we will pass it from the web page sending the data. The primary key is a combination of the 4 dimensions we chose from our dashboard. In MySQL, this will allow us to “insert or update” comments in one query. That is, we’ll be able to have MySQL decide if a certain comment already exists, and if so, update it. input_comment.php: actually more HTML than PHP, this is the page that displays the form for the entry of the comment by the user. This is the page that will be displayed when someone selects part of the chart, and clicks through on the link in the tooltip. We’ll make sure it is displayed in the dashboard by using a Web Page object there. submit_insert.php: this is the PHP code which does the actual work: it will receive the comment (and necessary dimensions and metadata such as the username) from the first page, and insert the data into the table. It will then display either a message confirming the successful addition of the comment, or the error that may have been triggered. 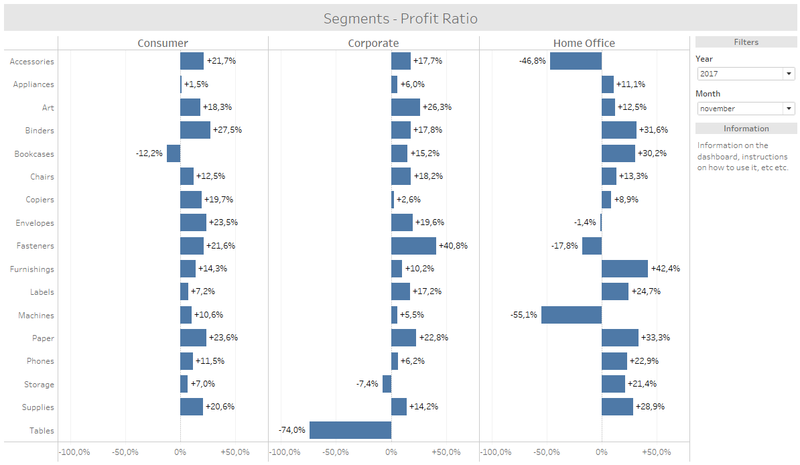 With these pages having been set up and being hosted where we need them to be, it’s time to modify our Tableau dashboards to make use of all this. As mentioned above, we’ll want to use a link from a tooltip to indicate which mark we want to comment on. This URL will load our form into the Web Page object of our dashboard, while at the same time feeding it with the parameters it needs (Segment, Category, Year, Month). Add a Web Page object to the bottom right of the dashboard, leaving the URL blank for now. Then what we can do as well, is change the settings for the tooltips to appear “on hover” instead of responsively; which I find slightly easier when using hyperlinks in comments. This was the hard part of the whole exercise. We’ve created the tiny web app that saves comment to the database. All that’s now left to do is… Retrieve this comment and display it in our dashboard. There’s different ways this can be achieved. 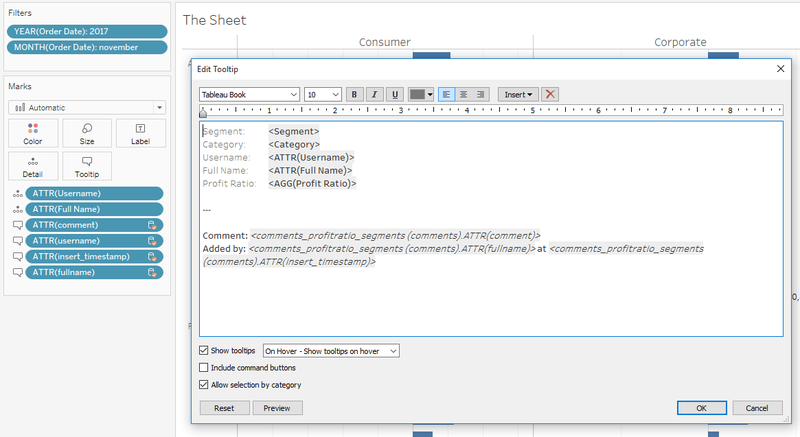 You can blend in the table containing the comments, and enforce the relationship on the necessary dimensions. 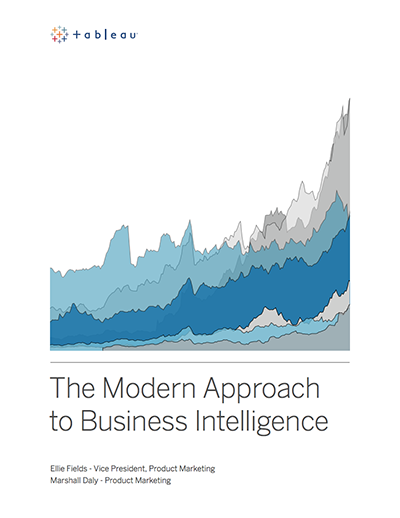 This blended data source can be either live (show comments by hitting refresh on Tableau Server) or extracted (periodically refresh automatically). You can also join in the table, and maybe refresh the whole thing daily, if extracted. In this case, we’ll go with blending, so we start by adding a completely new data source, the connection to our table. We’re then defining the relationship (Data > Edit Relationships) between my two source manually, as the names don’t fully match and we have a “year of date” to match with a “simple year”. So there you have it – a basic but powerful mechanism for adding comments to dashboards. There’s a lot of other principles that can be applied here. Currently anyone with access to the dashboard could comment on it, but we could build in the functionality to only allow commenting by certain users. This could probably be achieved by checking whether they are part of a certain Tableau Server users group. Furthermore, the actual form for submitting comments could be made more interactive. The whole thing can be further developed to work for multiple dashboards, in all kinds of ways. You’re welcome to extend on this functionality and present your own findings in the comments! Is the website published? Does it require to install PHP in tableau server? While you do need to have a web application server to run the PHP part and to host the database, it’s usually not advised to do so on the same host as Tableau Server. Typically, a separate server would be provisioned for hosting this application and potentially others that are related. 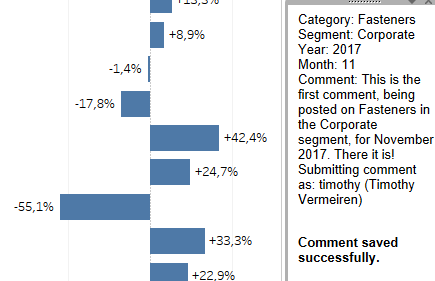 I’m a Tableau 10.0 user and am considering upgrading to 10.4… at the beginning of the article you mention that 10.4 has a new comments feature and I’ve researched it a lot, but haven’t been able to establish if the comments can be tied to a saved view only, or if every comment shows up in every view (saved/default) as per 10.0. Essentially I want to create views and have people comment on that specific view rather than the whole workbook/dashboard. If all comments are displayed, it would be impossible to track what comment relates to what saved view and I would need to pursue option 2/3 instead. Any ideas? Please vote for the idea if you think it would be useful. This is by far the best tutorial to make the write back to database. I am aware there might be some security issues with the GET but this is used in internal website so external access to the server is not possible anyway! Terrific post, however , I was wondering if you could write a litte more on this subject? I’d be very grateful if you could elaborate a little bit more. Thank you! Is the website published? Do you publish this workbook on the public tableau server or smth like this to get twbx? I’m wondering how to connect PHP server with tableau and embedded tablea report there. Thanks! Thanks! Yes, the website is “published”, or rather hosted on a web server. It’s not hosted on the Tableau Server. The connection between both is nothing more than that web part on the dashboard that points to the web server. I know far more about the PHP code than Tableau… how could the visual cue be added to show a comment has been made for a specific mark? Hi Kurt! I would basically just create an additional calculated field that checks if there is effectively a comment for that mark. Could be done with e.g. verifying if the length of the comment is greater than zero, or simply if it is not null. Then, that calculated field (which would be a boolean) could be used on any property on the mark’s card e.g. size or color to indicate a comment being present or not. Great Article. One question though, the relationships re not able to show multiple comments for a single category/segment. They show asterisks (*) when there are multiple comments matching. Any work around for this? You’re right, I only intended this solution to work for unique combinations of dimensions. I think it would probably be a good idea to keep it like this, unless… Do you want to display multiple people’s comments? I can see why that would be useful, but I’m not sure how you would get that to work. Perhaps with some kind of table calculation to concatenate the comments. 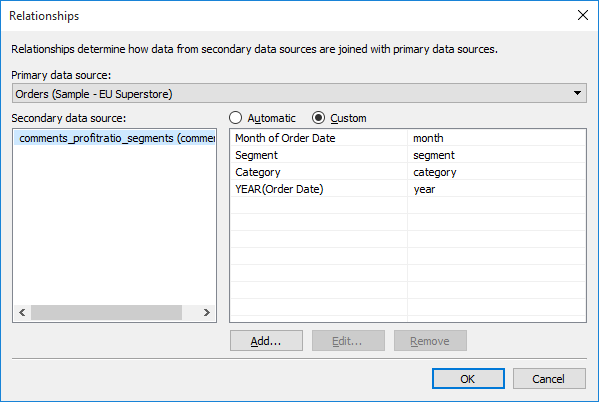 Did you consider accessing the PostgreSQL back-end behind Tableau’s metadata model? 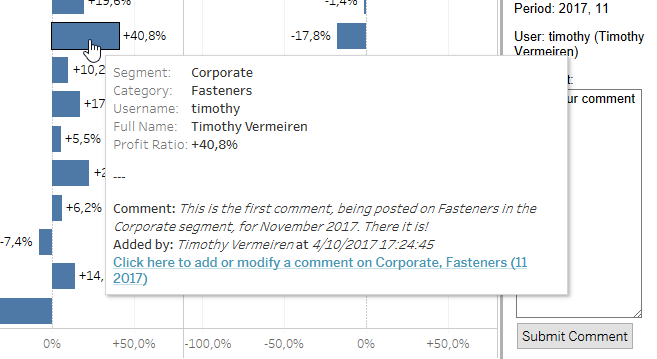 When we add a comment to a dimension or measure, it allows rich formatting. Or perhaps a way if the workbook and your comment server were not fully connected, there would be a ‘within-Tableau’ backup of whatever comments have been added internally. Good point, Izik. Back when I wrote this blog post, the features around comments were very, very limited. You could not even tie them to a snapshot. We could reconsider using the Tableau repository as a source for retrieving comments and displaying them in some other way, indeed.